Fine Treatment recommends new Thermobalancing Therapy as a novel approach to prostate enlargement treatment that does not involve surgically induced tissue destruction or ablation. Dr. Allen’s natural device provides an intensive focused treatment for the prostate gland and, consequently, achieves positive therapeutic results. This new therapy is the only natural way to relieve the symptoms of enlarged prostate by reducing its size, and protects men from risky surgical removal of the prostate tissue. In order to improve the symptoms of benign prostatic hyperplasia (BPH), new Thermobalancing Therapy increases blood circulation in the prostate gland that gradually cleanses the prostate from the overgrown tissue, states Fine Treatment. There is no need to have a risky surgical removal of the prostate tissue. 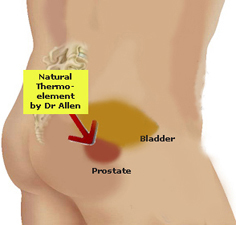 Dr. Allen’s device is focused on getting closer to the affected prostate and, by maintaining the constant temperature locally, increases the blood flow at the capillary level inside the prostate. This process terminates BPH progression and gradually decreases the size of the enlarged prostate. Both open prostatectomy and transurethral resection, on the other hand, involve hospitalization, general or spinal anesthesia and a surgical procedure, in which prostate tissue is cut away. According to the National Institute of Health (NIH), there are risks associated with the surgery: blood loss, breathing problem, infection, pneumonia, heart attack or stroke during surgery, reactions to medications; and there are also risks connected to the prostate tissue removal, such as problems with urine control (incontinence), loss of sperm fertility (infertility), erection problems (impotence) and others. Thus it is obvious that the Thermobalancing Therapy is the most appropriate treatment option for benign prostatic hyperplasia as it is free from any adverse side effects. Dr. Allen’s Device for Prostate Care is specially designed as a belt to be applied in close proximity to the prostate gland and that enables the therapy work all the time while it is worn. Slowly the prostate shrinks to its usual weight. Oxford Innovation Centre has recorded a video interview http://www.youtube.com/watch?v=dCFy_jZgCLw with a patient and shows medical documents which confirm that this natural therapy has reversed BPH. Dr. Simon Allen is a highly experienced medical professional. He qualified as a medical doctor 40 years ago subsequently heading a hospital. Reaching over 85 countries globally, Fine Treatment offers unique devices for prostate treatment, for dissolving kidney stones, for the relief of back pain, including sciatica, and for the treatment of coronary heart disease and the post-heart attack condition.